So, it’s finally happened. I decided to quit my full time job and work entirely on Gunnerkrigg Court and comics in general. I think it is about time. The answer is, quite simply, time. For a while now I’ve felt that I’ve just not had the time to spend concentrating on each individual page of Gunnerkrigg Court. Since I had to finish three whole pages over essentially a day and a half during the weekends, I didn’t feel like I was doing the story, or you, the reader, justice. 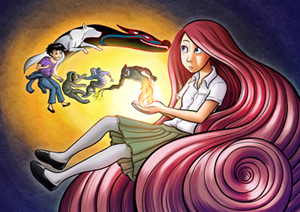 Gunnerkrigg Court has become a very large, and very special part of my life and I want, more than anything, to reach the end, and that just wasn’t going to happen with a full time job. Does this mean you make enough money to live from the comic now? Haha! No way! Up to now I've been entirely supported by my full time job and because of my lack of time to do anything beside the comic, I’ve not paid enough attention to merchandising and money-making as I should have, so I make very little from it right now. I knew I wanted to do this full time, but I realise it was a big risk leaving full time employment to do it. So what are you going to do about it, Tom? Well! I figure it’s about time I took things seriously. Here is a list of things you can be expecting from me in the future, presented in an oldschool HTML bullet point list! Topatoco. I hope to have more things up here now that I can spend the time to think about them. More shirts? Sure! Prints and all that? Yes! Special things such as Coyote plushies, hoodies, more books and anything else I can think of? Heck yes I hope so! Custom Drawings and full on commissions. These will be back in full force soon! Not only the old black and white stuff, but also a full range of commissions, digital and otherwise. Extra comics. Now these are what I am most excited about! You see, when you work on a long form comic like mine with a definite plot and a lot of characters, there are a lot of little things that need to be cut out. Character interactions that don’t affect the story, character histories, short stories, all sorts of things like that. I didn’t want to add filler to the main story (and Chapter 36 is not filler guys come on there was a point to all that crazyness), but I would love to spend extra time on my characters. So, when I can, while working on the main comic, commissions and anything else, I’m going to be working on extra comics that I’ll release now and then along side Gunnerkrigg. Some tangential, some directly related, some not related at all! My hope is to get enough extra material made so I can put a book of short stories together and get that printed myself! Extra STUFF! Wallpapers, canvases, paintings, auctions, anything I can think of really! Keep an eye on the site, my Tumblr, Twitter and all that and I’ll be sure to let everyone know what I’m up to. Donations. Donations are a HUGE help to me. So far they have ensured that not only are my site costs covered, but I've also been able to pay for a site with better RAM and bandwith to cover the extra traffic I have been getting as the years have gone on. If you feel that you have gained something by reading my comic, or you feel that it has some value to you and you don't really need merchandise as well, please consider making a contribution. I'm happy to accept donations as it's really the only way to make money directly off the comic itself and it's thanks to the Internet that such an option is available. So, in the end I feel like I have a lot of stuff I want to work on, and I don’t think I will be at a loss for things to do. I hope you will stick around and enjoy! Yes! I have a couple more things to say! First off, I wanted to say a big thank you to you, the readers. I can’t tell you how happy I am to have had such an overwhelmingly positive reaction to Gunnerkrigg Court so far, and the very notion of being able to do this full time wouldn’t have been possible if you weren’t here reading along, encouraging and supporting me as I work. How lucky I have been! I didn’t want to let this opportunity pass me by and I want to make the best story I can for you. In the long run, I don’t want Gunnerkrigg Court to be the only comic I make. I want it to be the first of many and if I can just get this right, I look forward to drawing comics for the foreseeable future, and I hope you all enjoy it too! Secondly: you want a wallpaper? I got a wallpaper! I got one right here! Seriously though, I hope to do wallpapers once in a while, and you can get them if you’d like to donate any amount! There is a regular donate button too, and I might make it a little more prominent on the site, but if you would like a fancy new graphic for your desktop, just click the donate button below! You should be redirected to the wallpapers after you're done. If not, just send me a note!